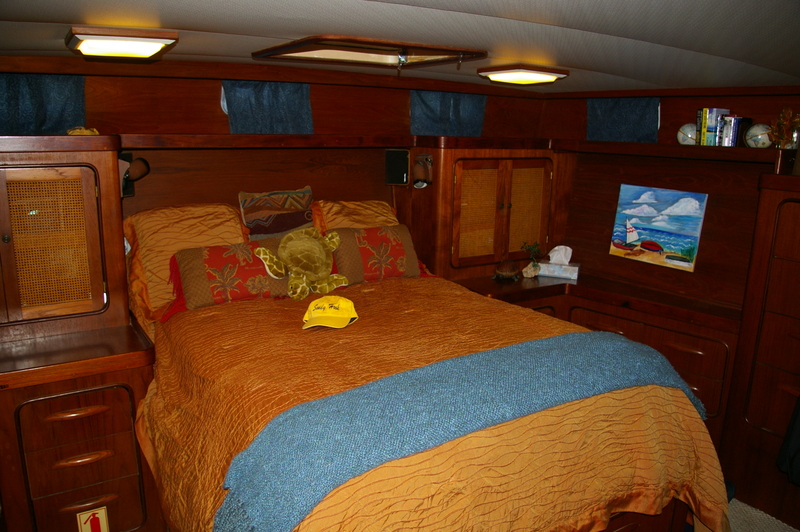 You can have your own adventure aboard your boat. 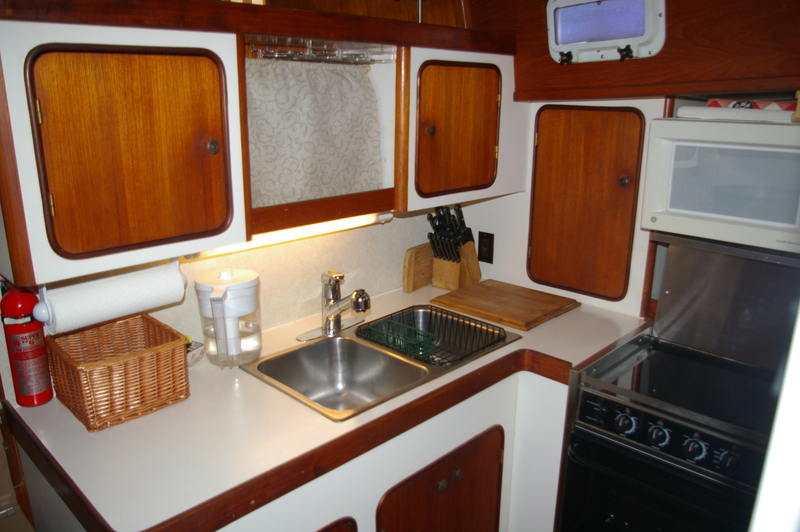 You will learn about navigation, anchoring, weather and basic maintenance hands-on! 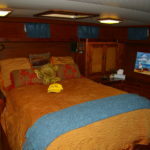 Just call us to schedule your learn-aboard vacation with Captain Chris Yacht Services. 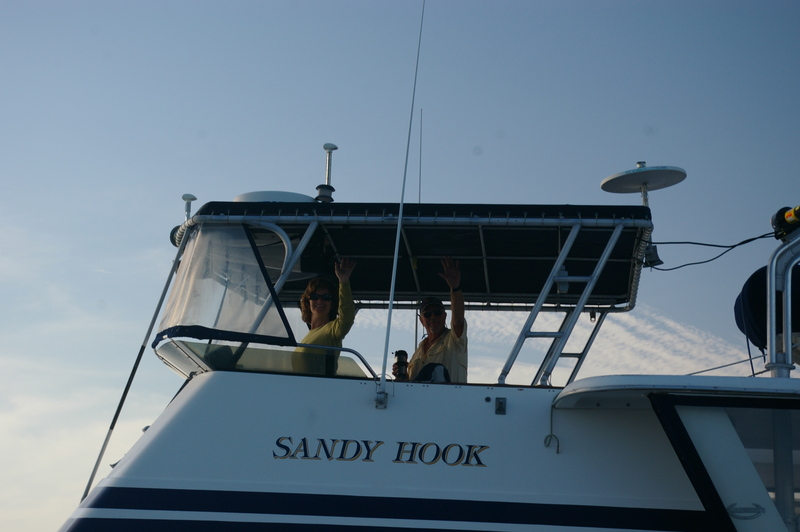 …A few weeks before this adventure we take Sandy Hook out on three short day trips: first, to clean the gear, scraping barnacles off the props and shafts, and then to check out anything else that may need attention before leaving the safety of a car and a nearby marine store. The maintenance and training side of our business has grown so we squeeze in a vacation of our own. 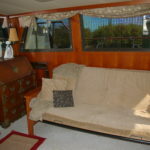 Now we are ready for a few weeks away from the dock. 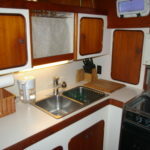 Starting out in the ICW from Fort Pierce FL, we meander down to Stuart at 6.5 knots/1600RPMs, our most efficient speed. It’s a Friday so the Florida waterways are only a dull roar as they build to the crazy weekend frenzy. Things are humming along well so we consider an ocean run. “The Crossroads” almost need a traffic cop as we dodge the center-console fishing boats and big sportfish who are all headed out to the ocean with us. The St. Lucie Inlet can be treacherous with its constant shifting shoals but today it looks quite manageable. 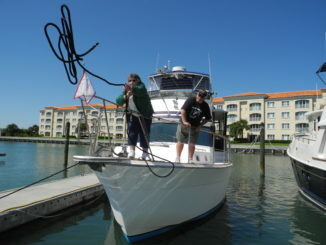 As we clear the rock jetties we set one fishing line out and turn south aiming for Lake Worth, Palm Beach. Seas are calm and blue, radio is playing the oldies, just kicking back reading and relaxing. Then the reel starts scrrrrrrrreaming. FISH ON! 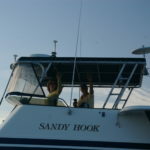 Remember, Sandy Hook is a trawler with a rather high back deck. 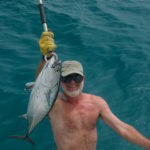 Getting creative we manage to catch AND BOAT a Little Tunny. Better known as a Bonita this is a beautiful fish in the Tuna family. We’ll share him later with some friends we’re meeting in the Keys. 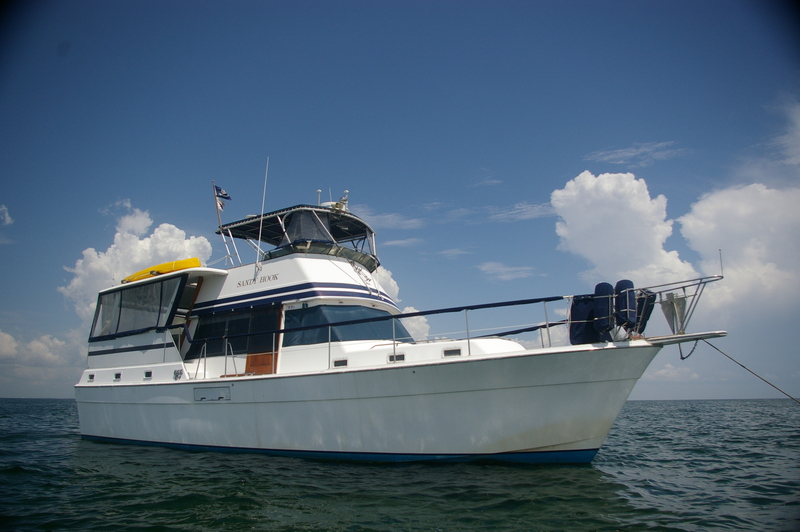 The inlet at Lake Worth is easy to navigate in any conditions so we aim for the entrance and anchor south of Peanut Island. Beautiful night, full moon, high tide, clear blue water mirror slick. We can even see the starfish on the bottom without using a flashlight! Yes, this vacation is a good thing. Next morning we head out to sea with Miami as our target. Hours later we arrive in Government Cut, the port of Miami’s commercial inlet. The Gulf Stream is quite close to shore so we have a good current in our face knocking us back almost 2 knots all day. Oh well. Veering south into Fishermans Channel we head for the ICW to cross under the Rickenbacker Causeway Bridge. This will be our anchorage for the evening. On a Saturday night we prefer the solitude as we check out the wild colors of the Miami skyline. At the nearby marine stadium anchorage there is loud salsa music and partying all night long. Something for everyone on the water! A gorgeous sunrise tells us it’s time to pull the hook and head for Key Largo. Only a 45 mile journey planned for today. 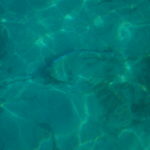 We remember why we spent almost two years in The Keys as we enter the clear waters of Biscayne Bay. 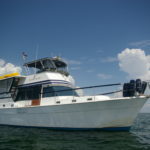 This begins the Florida Keys Marine Sanctuary. Gotta switch over from our Lectra/San to the holding tank to meet the regulations. Crossing under the Card Sound Bridge we can see the new 65 foot Jew Fish Creek Bridge standing tall and blue in the distance…Belize Blue? Yup, it’s painted such a vivid blue that it looks more like Miami Vice Turquoise. The old draw bridge is still in operation until the new bridge is complete so we radio for an opening and hear a sweet woman’s voice in answer. She tells us everything we need to know and then some. The official Welcome Committee to the FL Keys, she is a very nice surprise when compared to some other bridge tenders we have radioed. Can you imagine a bridge tender who stands outside and does the beauty queen wave to every boat that passes? Passing through both bridges we see Gilbert’s Marina and Resort on our starboard and the new Anchorage Marina on our port. We head out to the end of the buoy chain and turn right to find a deep spot to anchor. 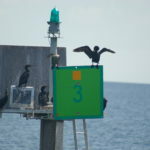 Deep means 5 feet at low tide in The Keys. It’s all relative. 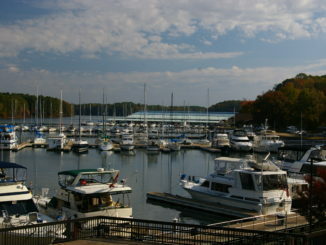 We launch the dinghy and race into shore at Gilberts to visit some old marina buddies. Lots of sea stories to swap and Blink! A few days speed by and it’s time to head home. First stop northbound is Boca Chita, just north of Elliot Key. An old lighthouse marks the entrance. We anchor a mile off shore just outside the channel and dinghy in to the park. There is a small basin with a seawall where we can tie up. It feels good to stretch our legs and walk around a bit. Beautiful picnic area. Just 200 yards away is a small beach on the Atlantic Ocean. CAUTION. The water in the entrance to the basin is too shallow for our 4 foot draft. You decide if you can get in and back out. 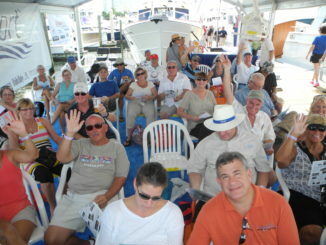 Our Miami to Lake Worth run is an economical surprise. Because the Gulfstream is so close to shore we gain an additional 3.5 knots SOG!!! 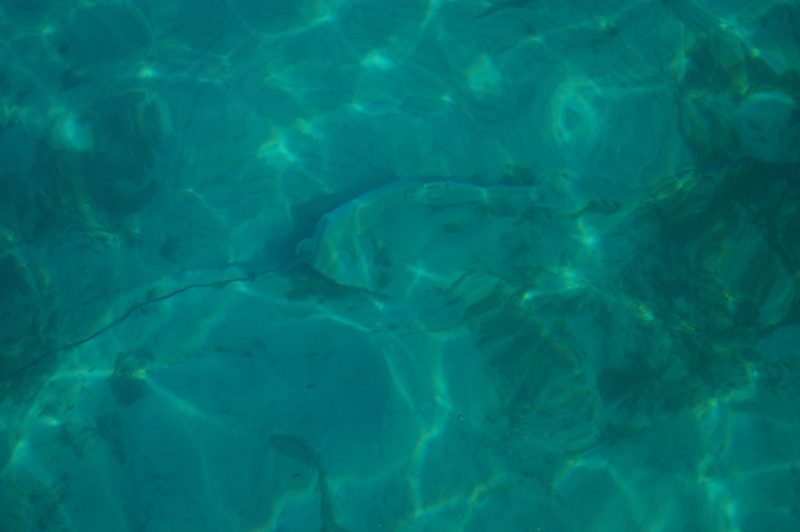 We also catch a Dolphin (mahi-mahi) while running the rip line. Fun. 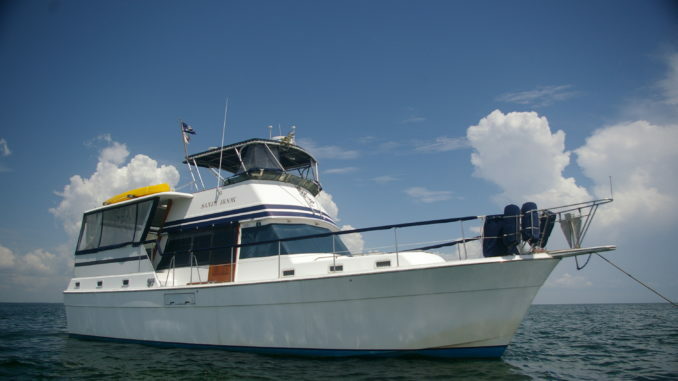 That afternoon we enter Lake Worth, drop the dinghy and enjoy a mini cruise around Peanut Island. After dinner we watch the early news to get a local weather report. Winds are calm, forecast is a repeat of today so off to bed we go. We wake around 11PM with a bad feeling and a bit of bucking. A large black front is approaching, growing quickly before our eyes. Sandy Hook already swung around from the incoming tide to face the NNW wind and is now riding the building chop. As the storm develops we watch and gauge our anchored position relative to the other boats near us as well as the structures on shore. Hard to do as we’re being pelted with what feels like hail. The winds are now 30 knots and gusting much higher. We watch and watch and…QUICK! Start the engines! We’re dragging anchor! A 50 foot sailboat is now directly behind us and a 75 foot trawler is a little farther aft with his running lights on. We kick into team action, Alyse at the helm and Chris on deck to pull up the anchor. Before we are done we reset the first anchor- a MAX- and deploy a second anchor – a Delta- because we don’t know the severity of the storm. Thirty minutes later it is all over; the front is passed and we didn’t get any rain to speak of. By the way, NOAA continues to report winds SSW 5-10 knots. Hmmph. 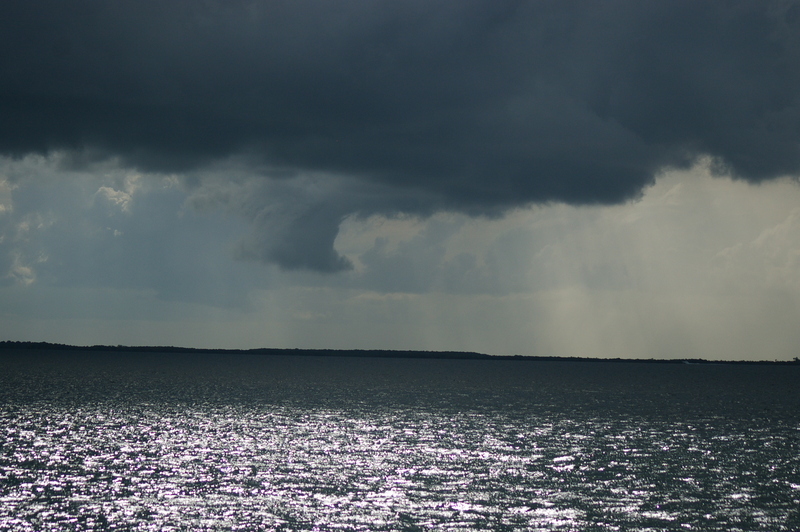 Our last day on the high seas brings us more fabulous weather. 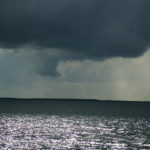 Wicked storms are seen on shore and a few water spouts try to form miles away from us but we’re soaking up sunshine as the Sandy Hook cruises off shore heading to Fort Pierce Inlet. RRRRRRRRRRRRRRR FISH ON!! 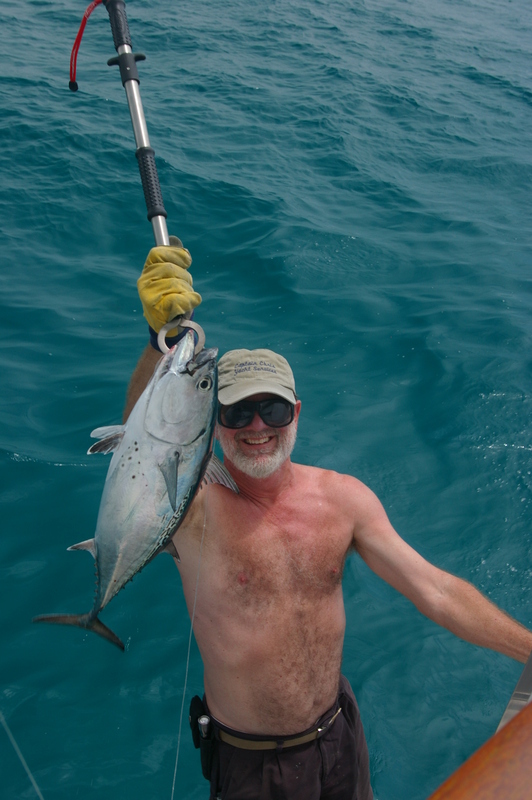 Another Bonita hooks onto our lure and we have a great welcome home dinner in the making. 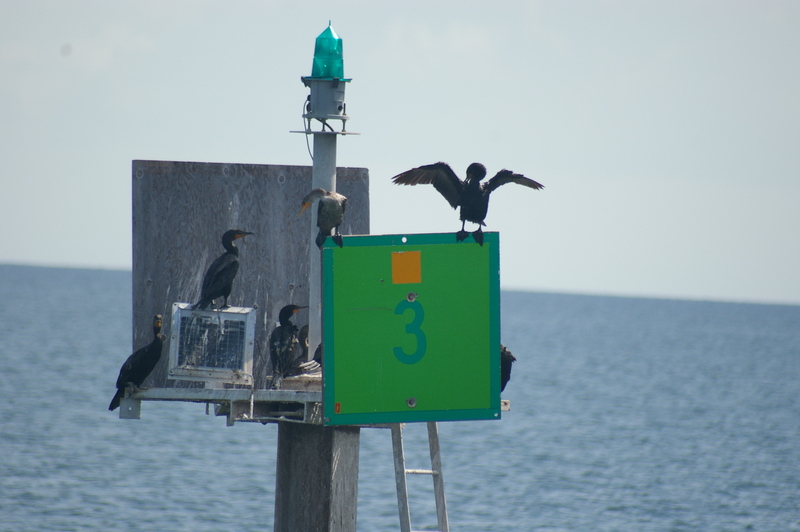 A few marina friends greet us back at the dock, everyone bringing a dish to complement the fish. 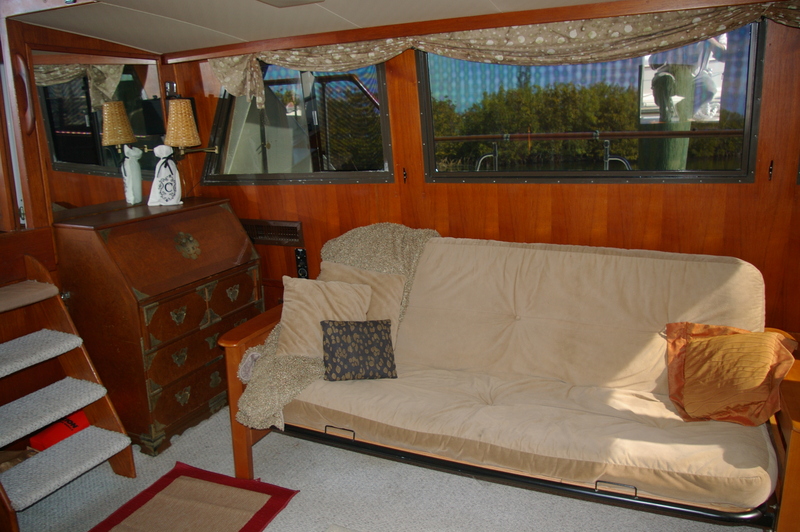 This is such a great vacation…..Everyday can be a vacation if you have a boat.